When it comes to reading on Android, there are a lot of options. Of course, the biggest two out there are the Amazon Kindle app and the Nook App by Barnes and Noble. These applications are huge, and generally involve more buying books than getting access to books and other documents you already own. Now, there’s an app for readers who don’t need to expand their library. An alternative is the application Fabrik Reader. It was developed by XDA Forum Member eirikrwu and it’s available, of course, free of charge. The premise of the application is simple: it gives you more access to your own txt, epub, and mobi books without the extra stuff often found in other reader applications. There is even an option to pull books directly from your Dropbox account so you don’t have to store them all on your device. ★ Complete synchronization of the entire reading experience with your Dropbox. That means, all your books, as well as all your reading progress. So you can use as many devices to read as you want, and everything will just keep in sync automatically. ★ A beautiful interface that will make your reading experience really premium, and easy on your eye. ★ Find covers for your book automatically which make your book looks even better. 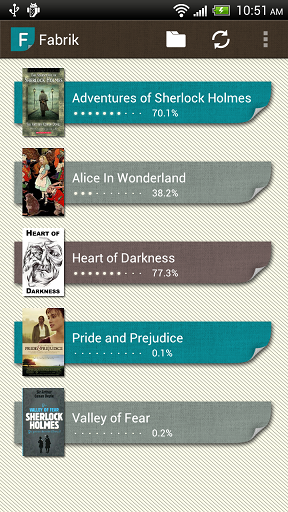 ★ Share your reading progress(with a beautiful book cover). ★ Some more general stuff in an ebook reader, like adjust text size, screen brightness, night model, etc. ★ Support txt, epub, mobi format (and more will come in the future). There has been quite a bit of input and feature requests. Most people seem to like it quite a bit, and a very decent list of future features has already been created. Future updates should support more file types, landscape mode for tablets, and possibly even other cloud sources. If you’d like to know more or suggest another feature, check out the original thread.